Reference work involves both routine and new challenges. One of the most satisfying aspects of this work is having the opportunity to learn something each day. At the Presbyterian Historical Society, we recently received a request from a woman who recalled raising funds in her Sunday school class in the 1950s for leprosy missions using a piggy bank called "Pete, the Leprosy Pig." Initially, the request sounded very obscure, but as our reference staff searched our catalogs and databases, we discovered that we not only have information about Pete the Pig in our collections, but we have a small, plastic Pete piggy bank in our museum collection. The story that accompanies Pete is both inspiring and heartwarming. 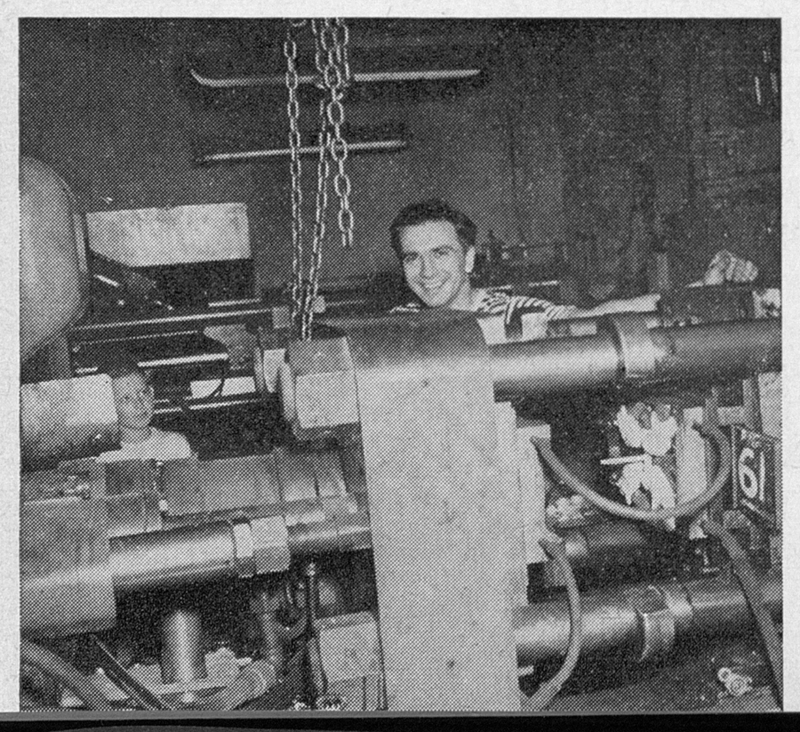 Hartland Plastics, Inc., Hartland, Wisconsin, where "Petes" were born. Leprosy Missions Digest, 1948. Pete the Pig is a fundraising campaign of the American Leprosy Missions, formerly the American Mission to Lepers, Inc., a Christian non-denominational organization founded by missionaries in 1906 to cure and care for people suffering from leprosy. 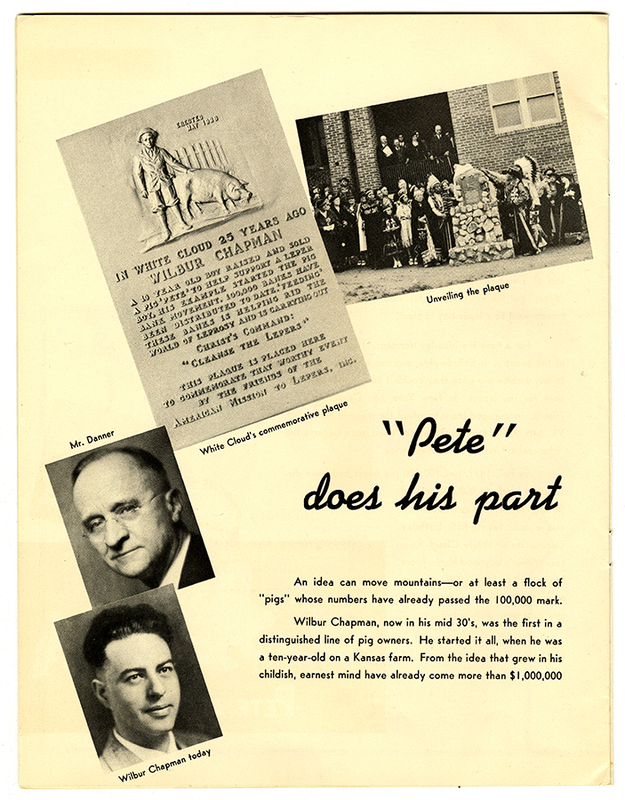 The story of Pete began in 1913, when the family of a young farm boy in Kansas named Wilbur Chapman received a visitor from New York. "Uncle Will" was William M. Danner, an executive with the American Mission to Lepers, Inc. Upon his departure, Uncle Will gave Wilbur three silver-dollar coins. Wilbur was so inspired by Uncle Will's gift that he decided to do his part to help others. Using his coins he bought a piglet that he named Pete. Once Pete was big and fat, Wilbur sold the pig for $25 and then donated the money to the American Leprosy Missions; at that time, a gift of $25 provided medical care for a leprosy patient for one full year. It turned out that other children wanted to help just like Wilbur, and the practice of saving coins in pig banks was born. 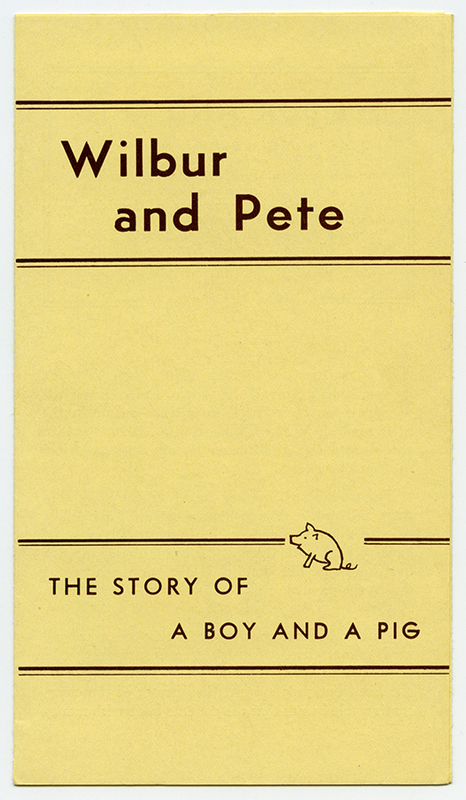 Wilbur and Pete pamphlet from the Eugene R. Kellersberger Papers. RG 436, Box 15, Folder 15. "Pete" does his part from publicity brochure of the American Leprosy Missions. Eugene R. Kellersberger Papers, RG 436, Box 15, Folder 19. The collections of the Presbyterian Historical Society document medical mission work with patients suffering from leprosy, also known as Hansen's disease, through personal papers and national agency records. These collections include the papers of Dr. Eugene Kellersberger and his wife, Julia Kellersberger, who worked with the American Leprosy Missions organization from 1940 to the early 1950s, as General Secretary and Promotional Secretary respectively. The Eugene R. Kellersberger Papers in our holdings document the mission work of Dr. Kellersberger and his wife in the Congo, as well as their broader work to raise awareness about Hansen's disease and raise funds for treatment. Children around the world continue to support the work of the American Leprosy Missions through their pig banks and keep the legacy of Pete alive. "Pigs Go 'Round the World" brochure from the Eugene R. Kellersberger Papers, RG 436, Box 15, Folder 19. Tubman Pig Pasture. After a talk by Mrs. Julia Kellersberger, students at Tubman High School for Girls, Tubman, Georgia, made these houses, troughs and pasture for their Petes. Leprosy Missions Digest, 1948.